6.5" by 3" by 4.5"
”And your little dog, too!” They’re five of the most frightening words in movie history. It’s one thing for a witch to threaten a young girl who’s wandering lost and confused around a magical land in which she’s been stranded through no fault of her own, but when you mix in a specific threat against her adorable little dog? Well, that’s the dividing line between your basic bad witch and a truly wicked witch. It’s especially wicked when you realize that this witch doesn’t make empty threats - she’’s got the evil spells and army of flying monkeys to back it up! But poor little Toto is safe as long as he’s tucked away inside Dorothy’s basket, content to peek out every now and then for a view of the Yellow Brick Road. And it doesn’t hurt that a tiny dog peering out of a wicker basket is just about the cutest thing anybody could ask for. Of course, it’s not always possible to carry around a live dog in a basket, so this is the next best thing. 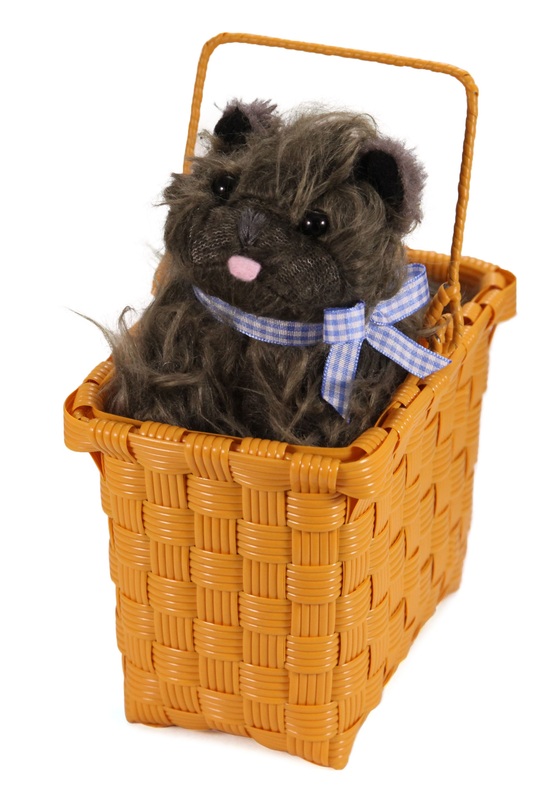 The plastic, wicker-style basket is small and easily portable, featuring a stuffed, fuzzy toy Toto who’s all bundled up and ready for adventure. Be sure to steer clear of witches, but lions should be all right, so long as you can confirm they’re the cowardly type.